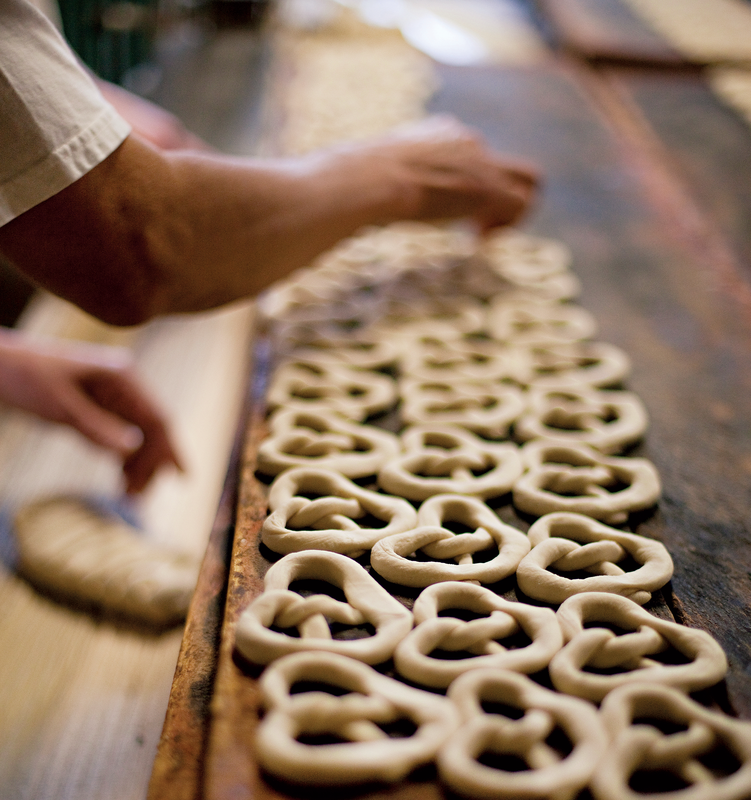 Pennsylvania Dutch treats aren't the only thing to relish in this cool food town. Hungry for more? 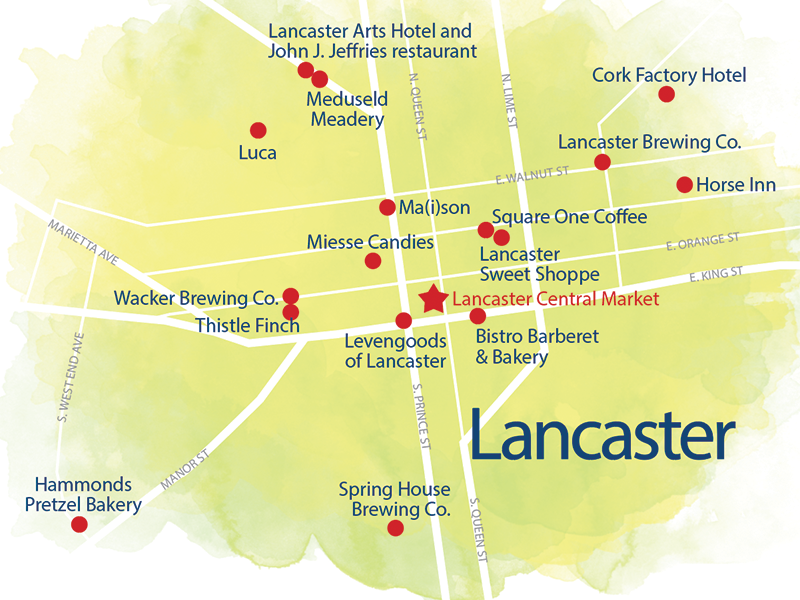 Beyond the Central Market, here are some other Lancaster establishments worth checking out. Cedric Barberet—a former executive pastry chef at Mar-a-Lago, President Donald Trump’s Palm Beach, Florida, club, who also made Trump’s seven-tier, 5-foot-high wedding cake when he married Melania in 2005—now owns Bistro Barberet & Bakery (barberetlancaster.com) in Lancaster. The French-trained toque, who more recently served as executive pastry chef at Philadelphia’s esteemed Le Bec-Fin and Buddakan restaurants, turns out gem-like confections at his chic, hot pink bakery. An elegant bistro completes the swanky scene. Google Maps hasn’t led you astray; there really is a pretzel factory at the end of a residential driveway. Hammond Pretzel Bakery (hammondspretzels.com) occupies the adjoining garages of former owners William Lichty and his grandfather William Hammond, both of whom started making hand-rolled sourdough pretzels there in 1931. Lard has since been replaced by soybean oil, but otherwise not much has changed as the congenial descendants of the two Williams operate the well-worn factory. 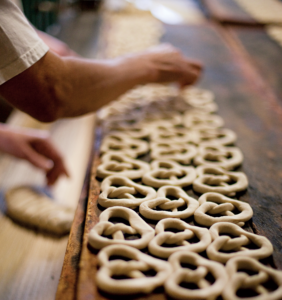 The bakery doesn’t give tours, but you can peek through the windows and see the staff knead, cut, roll and twist the dough, and in the small shop you can watch the freshly baked pretzels slide en masse out of the drying oven before being packaged. Lancaster Sweet Shoppe (lancastersweetshoppe.com) is the home of the Stroopie, the nickname for the Dutch stroopwafel, a waffled sandwich cookie filled with a thin layer of caramel. In addition to plain Stroopies and others dipped in chocolate, pecans, salted caramel or coconut, the sleek café sells chocolates made by Groff’s Candies (groffscandies.com), as well as scoops of local Pine View Dairy ice cream (pineviewdairy.com) and Stroopie ice cream sandwiches. Get the flat, round cinnamon-y cookies hot off the waffle iron in the morning, or warm one by resting it on the rim of a mug of hot coffee on-site or two doors down at Square One Coffee Roasters (squareonecoffee.com), an award-winning Lancaster micro-roaster. There were about 30 confectionary companies in Lancaster at the end of the 19th century, including Miesse Candies (miessecandies.com) founded by Daniel Miesse in 1875. Although there have been seven owners since then, his signature caramels live on, along with buttercreams, mints, peanut butter cups and more. Beyond the counter lies the production facility, where proprietor Tracy Artus and her crew still use equipment from the 1930s and ’40s to create more than 200 types of confections. Tours of the factory, which include chocolate samples and the chance to craft a piece of candy, are $5 and must be arranged in advance. Several of these facilities offer tours; check websites for details. Before Prohibition, Lancaster County was a hub of beer brewing, due in part to an influx of German immigrants in the 19th century. 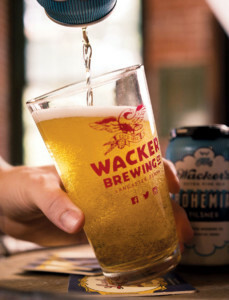 The oldest and longest-running brewery in Lancaster, Wacker Brewing Co. (wackerbrewing.com), dates to 1853 and now operates a taproom in a circa 1900 tobacco warehouse, offering tastings of its classic German beers, as well as Belgian and English brews made in the basement below. 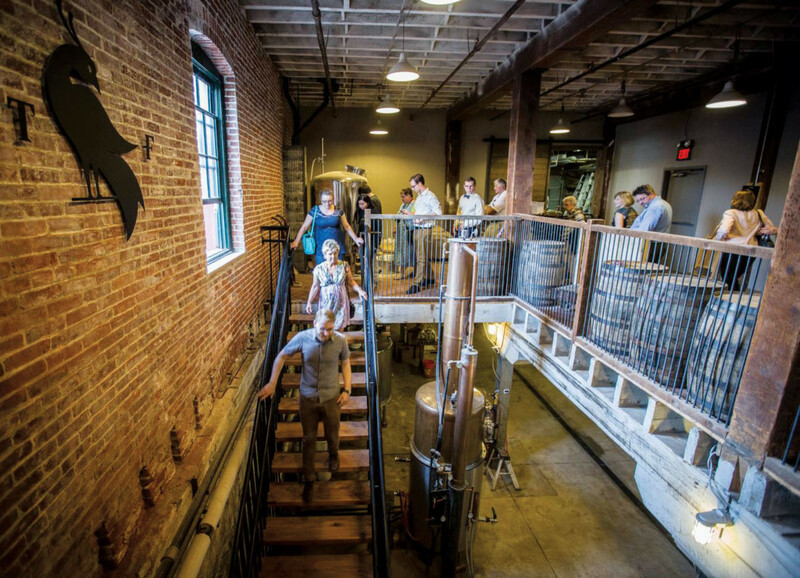 The brewery shares production and drinking space with Thistle Finch (thistlefinch.com), a craft distillery that turns out small-batch ryes, as well as gin and vodka. Housed in another historic tobacco warehouse, Lancaster Brewing Co. (lancasterbrewing.com) operates a bar and restaurant above the beer-making operation. You can watch the action below as you enjoy a tasting flight (don’t miss the Gold Star Pilsner and the Kölsch Ale). The quirky Spring House Brewing Co. (springhousebeer.com) operates a brewery with arcade games in the loft above, as well as a taproom at another location. Two of Lancaster’s newest craft drink destinations, both of which opened in 2017, are Meduseld Meadery (meduseldmeadery.com), which produces mead, the ancient beverage made by fermenting honey with water and yeast, and Levengoods of Lancaster (levengoodcider.com), a cidery that serves up variations such as Bourbon Barrel Aged Cider and Dry Cranberry Cider. The Horse Inn (horseinnlancaster.com) is a former speakeasy that’s located in an upstairs loft with a lot of historic character. A chalkboard lists the “farmers & friends” who’ve contributed ingredients to the night’s menu, and the food is quite good, as is the jazz trio that performs on Tuesday and Saturday evenings. 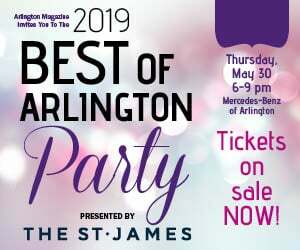 For a more formal dining experience, the Lancaster Arts Hotel’s John J. Jeffries restaurant (johnjjeffries.com) is seriously committed to serving local, sustainable and organic cuisine. 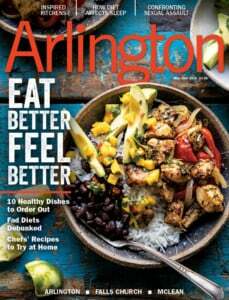 The owners are also partners in a nearby ranch; dishes made from its grass-fed beef include a small plate of shaved raw dry-aged beef sirloin served with an herb relish and thinly sliced scallops. Ma(i)son (maisonlancaster.com), an “intimate, farm-driven, urban cookery” (per its website), was cited by the Food Network’s Alton Brown as one of his top two favorite restaurants in the country in 2016. A more casual sister restaurant, Luca (lucalancaster.com), showcases Italian dishes made with local ingredients. As its name suggests, the Cork Factory Hotel (corkfactoryhotel.com) is located in a 19th-century cork factory, where a clever renovation combines the amenities of a boutique hotel with an edge of chic industrialism. Beyond the cork-walled lobby, the factory’s former boiler room has been transformed into a handsome bar and restaurant. The guest rooms sport high ceilings with unfinished wood beams and throw pillows covered with old black-and-white photos of historical figures. The Lancaster Arts Hotel (lancasterartshotel.com) is a former tobacco warehouse with a hip vibe that’s home to nearly 300 pieces of local art. Two of them—giant leather chairs with backs that look like tobacco leaves—are a focal point of the lobby. Carole Sugarman is a longtime food writer who grew up in Pennsylvania.